aka The First Marines. 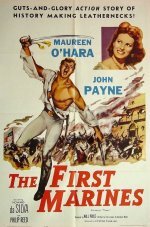 The U. S. Marine Corps hymn starts with "From the halls of Montezuma to the shores of Tripoli", and this film's story purports to be the reason why, and is give or take a few incidents in this movie: It is 1805 and the Tripoli pirates have challenged America's right to freedom of the seas---all of them, anywhere---so United States warships were sent to that port to bottle up their fleet and set the riff-raff right concerning who could sail where. A U.S. Marine unit, headed by Lieutenant O'Bannon, was sent to attack them from the rear. He organized his unit around Hamet, Pasha of Tripoli, in exile after being overthrown by his brother. In Hamet's court was Sheila D'Arneau, a diploma's daughter, who disguises herself as a dancing girl, and joins the group of eight U. S. Marines and Hamet supporters in their march across the Libyan desert.